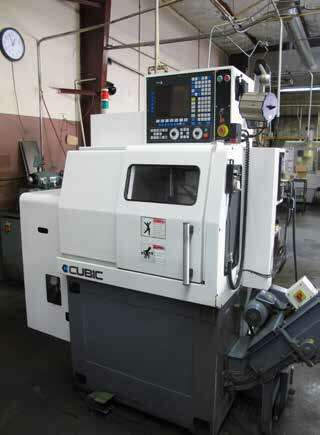 2012 CUBIC GTV-42 CNC TURNING CENTER, WITH FAGOR CONTROL, CHIP CONVEYOR, 16C COLLET NOSE, 6000 RPM, L SHAPE TOOL PLATE FOR LIVE TOOL, S/N GTV-42. 2005 HAAS SUPER MINI MILL VMC, 10 ATC, CT-40, S/N 44631. 2008 YAMA SEIKI TA-32 CNC GANG TOOL LATHE, WITH FANUC Oi MATE TC CONTROL, 6000 RPM, 5C COLLET NOSE AND CHUCK, CHIP CONVEYOR, S/N 81762. 2005 YAMA SEIKI TA-32 CNC GANG TOO LATHE, WITH FANUC Oi MATE TC CONTROL, 6000 RPM, CHUCK, CHIP CONVEYOR, S/N 81677. TAKANG TNC-05 CNC GANG TOOL LATHE, WITH FANUC OT CONTROL, S/N 510322. BRIDGEPORT VERTICAL MILLING MACHINE, MITUTOYO DRO, POWER FEED TABE, 1.5 HP, VARIABLE SPEED 9 X 42 TABLE. TAKANG MODEL TNC-05 CNC GANG TOOL LATHE, FANUC OT CONTROL. GEMINI ROTO FINISH VIBRATORY TUMBLER MODEL 6485, S/N G-700-04-B13. CUSTOM MULTI STATION DRILLING AND FORMING STATION WITH BOWL FEED AND LIGHT CURTAINS.